Printing & Packaging Companies: how to get more competitive edges by spending less? Competitions exist in every industry and among different companies. It is the same situation in printing & packaging industry. More and more companies in printing and packaging industry are considering to buy machines to make their production more automatic and intelligent and to increase the production efficiency. Machines are the key to keep the products' quality in a stable level because of less human factors will affect the production process. Take die making as the example, almost all middle and big die making companies are using laser machine to cut the die board. Laser machine as the advanced technology, increases the efficiency and speed, also has a better performance in die board cutting than manual die board sawing machine. But laser machine, especially high power laser machine are expensive and requires different configuration, such as laser generator, laser tube, gas supplying system, cooling system etc. The total system is very complicated and need a big cost to make machine maintenance. Laser machine is also very electricity-cunsuming. Anyway, the cost for a laser machine is high, let alone the imported laser machine. Now we have a new automatic die board machine to help you grow the die board making business. You can get the unique competitive edges from it but also save the maintenance cost as it is the global first automatic die board sawing machine. It is environmentally friendly, high cutting accucy and also very cost saving and energy saving. It is a totally different machine with laser. It doesn't use laser , but use saw blade to cut the die board. 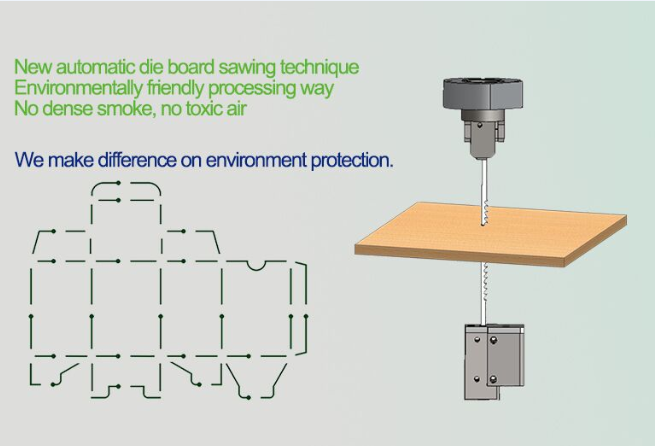 The kerf of the die board comes with higher precision and higher accuracy, and more durable. The processing way is a eco-friendly way which doesn't produce dense smoke and toxic air. And it only needs around 500~600w power supply which is very energy-saving. 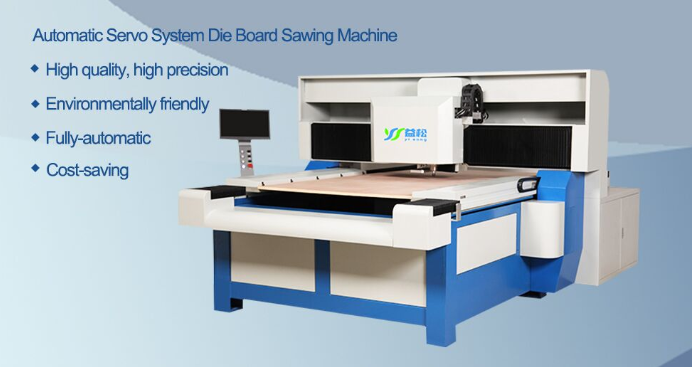 Here is the Comparison video link between laser machine and our die board sawing machine. You will get more competitive if you get this machine, and it can be really cost-saving for a long term running.